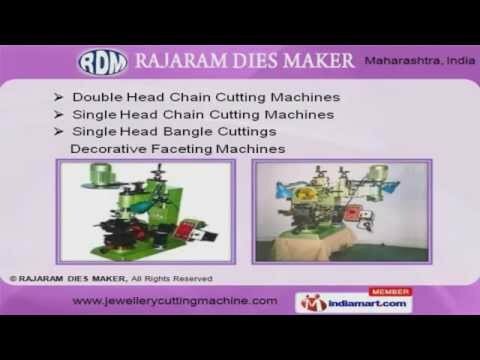 Welcome to Rajaram Dies Maker, Manufacturer and Exporter of Machine Tools. The company was established in 1977 at Mumbai. Our Technically sound infrastructure and higher productivity ratio help us to serve East Asia, Middle East and other countries. We are backed by Expert workforce, well developed R and D departments and High grade raw materials. We offer a wide assortment of Cutting, Rolling and Forming Machines. Cutting and Faceting Machines are well known for their impeccable performance. Double and Single Head Chain Cutting Machines are extremely reliable. Rolling and Forming Machines offered by us are acknowledged for their durability. Our Satning and Blasting Machines are reckoned all over the world for their superb quality. We are one of the trusted names of the industry engaged in offering genuine quality Zig Zag Machines.